Just read a good article by Mark Thiele on Why Monopolies and Commoditization would pollute the cloud. It reminds me of my 2007 talk when I said "open source would be needed to counter the threat of monopolies in this space". "Cars have been around for over 100 years now, they must be commodity by now, right?" Here the article is assuming that the process of commoditisation is time based like diffusion i.e. adoption over time. In reality it depends upon the actors in the market and competition. 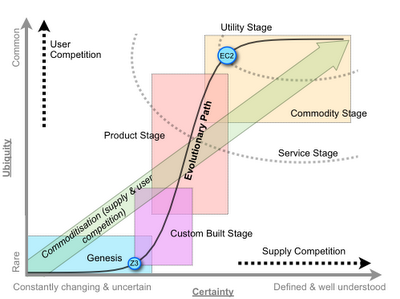 Hence evolution from the genesis of something to commodity is governed by ubiquity (how widespread something is and user / demand competition) and certainty (how feature complete something is and supplier / supply competition). See graph below. The nut and bolt took almost 2,000 years to go from genesis (first creation) to late product and commodity (starting with Maudslay's screw cutting lathe). Electricity took 1400 years from the Parthian Battery to Westinghouse / Tesla and A/C utility provision. Telephony about 100 years and computing infrastructure about 65+ years. So, you cannot assume some linear relationship with time. In industries where the car is a component of some other value chain (e.g. Taxis, Fleets, On Demand hire services etc) then it would be worth looking at whether standardisation has or is occurring. As the article points out the car itself has many commodity components but if the system you're examining is the top level system then you're always going to have branding, perception of other values which impact it. Gary Dahl's "Pet Rock" is probably the best loved example of associating a branding value with what remained a commodity ... it's not a rock (which it was) but a "Pet Rock". A comparison of computing infrastructure to cars is one of comparing a component to a higher order system which has other values (i.e. personal branding, status symbol etc). If the article was to compare like for like then it probably would end up with a different conclusion i.e. how many users of Amazon EC2 care or even know what hardware Amazon EC2 runs on - it's an invisible component, far down the value chain. The same can be said of how many users know or care what specification of nuts and bolts are used to build their car? "If we allow a few companies to push the technology to a true commodity business model"
First, it's not companies that drive things towards a commodity model but the interaction of users (demand competition) and suppliers (supply competition). The question of evolution (which for activities we call commoditisation) is separate from the question of centralisation / decentralisation and the two shouldn't be conflated. It would have been relatively trivial for the hardware manufacturers to create a price war in the IaaS space around 2008-2010 in order to fragment the market by increasing demand (computing infrastructure is elastic) beyond the capability of one vendor to supply. The fact they didn't is their own fault and also one of the major factors why we might see centralisation. The process of evolution (driven by demand and supply competition) is not time based but depends upon the overall interactions of ALL actors (users and suppliers). It is an inevitable process of competition. The question of centralisation / decentralisation varies with a number of different economic forces but it usually depends upon the actions and gameplay of SPECIFIC actors (suppliers). Often you will find that companies are suffering from inertia to change (due to past success) and hence new entrants into a market that is commoditising can quickly capture the market. This doesn't need to be the case though and the issue is one of executive failure usually of past giants and inability to react. Let me be absolutely clear here, commoditisation does not mean centralisation. There's a myth that it does, often used to create strawman arguments. These two issues of commoditisation and centralisation are entirely different things. However, it's probable that commoditisation of various IT activities (nee cloud) will lead to centralisation due to failure of competitors within this space. You can't assume that commoditisation and centralisation occur hand in hand but in the case of IaaS it's likely. Whilst "open source would be needed to counter the threat of monopolies in this space" still holds true, the actions since 2007 (particularly on differentiation) means the industry didn't counter the threat in the IaaS space. This didn't have to be the case, learning those lessons from HTTP and a more focused and earlier attack on becoming the open source AWS clone would have changed this. Unfortunately rather than a strong play, competitors have played a weak game and a period of monopoly / oligopoly looks destined to be the result. 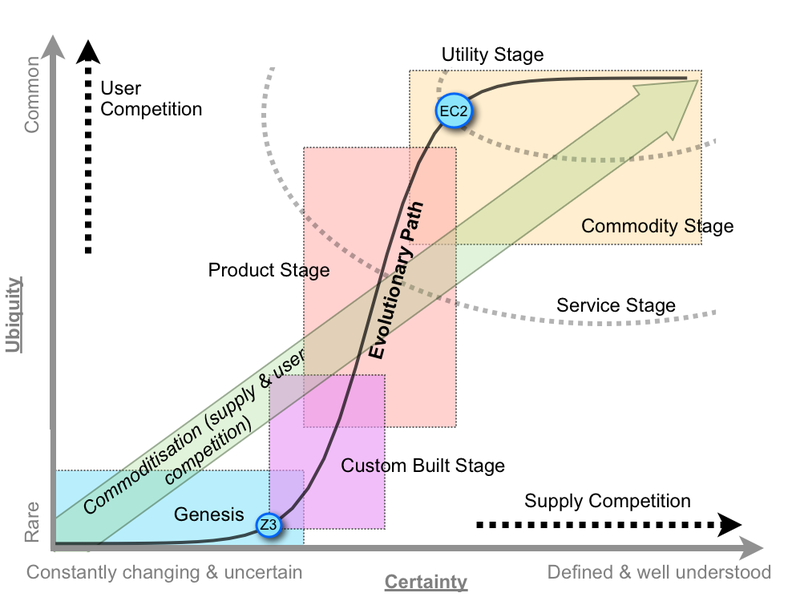 Hence the shift towards utility services is occurring (driven by actions of all players), open source is the route to creating competitive markets (in the final state) but due to Amazon playing the game well and most competitors having poor gameplay (with the possible exception of Google) then we're likely to see a period of monopoly / oligopoly in IaaS (of Amazon and Google) for far longer than was necessary. Fortunately, some (such as CloudStack, Eucalyptus and OpenStack groups like CloudScaling) appear to know how to play the game. So, I take the view that this won't be a permanent state of affairs and it will eventually work itself out in the IaaS space. We will eventually get those competitive markets based around open source IaaS or in the worst case scenario Government regulation. The downside, it'll take far longer than it needed to, by about 5-15 years (unless of course Amazon or Google decide to open up first or CloudStack suddenly becomes the focal point of intense competition e.g. VMware making a huge IaaS play based upon it). We will eventually get there but as I've said, centralisation / decentralisation all depends upon how well the actors played the game and let's be frank - most haven't played it well. Luckily for all of us, CloudFoundry is playing a very smart game in the platform space, so that area seems less of a problem. Quite the opposite. There are two aspects of innovation here - operational efficiency and creation of higher order systems. Innovation is one of those awful words which means many different things, however the two are not the same. Computing to Big Data and all the changes we're seeing today. Hence commoditisation always increases innovation (as in genesis of higher order systems), this effect is known as componentisation (Herbert Simon). Equally, innovation behind the interface doesn't stop i.e. electricity was standardised to an interface but innovation still occurs in the means of production (e.g. operational improvements and efficiency or new means of generation). This is the same with all manner of industries from finance to manufacturing (see float glass method of producing glass etc). You cannot therefore state that commoditisation inhibits or limits or stifles innovation, where historical evidence shows it not only allows for innovation in production but accelerates and enables innovation of higher order systems. Each of the major ages - industrial, mechanical, electrical, internet - are associated with commoditisation of pre-existing activities. "Drivers that make unique IT solutions critical"
The article is absolutely spot on that even in a mass market of commodity components there are always niches - same with electricity, finance, most manufacturing etc. You'd expect the same with computing. There will be highly profitable but small niches. "There are just too many ways to (in this case) build that car"
One of the most important parts of any of the common cycles of changes (i.e. ages) is the disruption of past giants stuck behind inertia barriers due to past success. Disruption comes in two forms - there's the unpredictable, unforeseeable (e.g. a change in characteristic of a product such as disk drives) and then there's the predictable (e.g. a shift of an activity from product & rental services to commodity and utility services). Both cause disruption, the former because it's unseen and hard to defend against, the latter because it's seen but the company is unable to react due to inertia (which is often embedded in the culture of the organisation). We've seen this in every major age and there is nothing which suggest that cloud, which was predicted by Douglas Parkhill in his 1966 book the challenge of the computing utility, will be any different. The list of companies who believed that their industry would not be commoditised is long and glorious from the gas lamp companies of the past to almost certainly modern infrastructure companies today. The problem for all is that their offering is just a component. Mark's article is interesting, adds to the debate but makes some hefty assumptions in my view and may even be victim of falling for many of the spreading myths. However, it's definitely well worth a read and a welcome change from some of the strawman arguments and schoolyard diatribe that I've been exposed to of late. It's a refreshingly sensible article. Its general premise on the danger of monopolies is one I wholeheartedly agree with. The reason this danger exists though is not one of commoditisation itself but instead executive failure of competitors - from differentiation strategies to failure to effectively execute and in many cases failure to act.